Any who back to my projects lol. I decided to create two projects using these cuties. I knew that I had to some how incorporate Alcohol ink into these projects, for me that was the first thing that popped into mind when I started playing around with them. 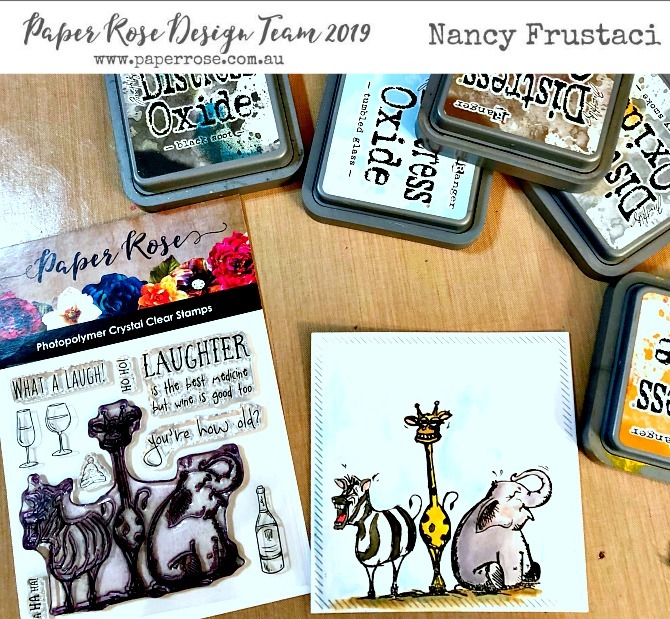 I started by stamping out the cute little images onto some Bristol water color paper using versa fine black onyx ink. I stamped out the image numerous times so I had extras to play around with and figure out the best color combo. I pulled out my distress oxide inks, water brush and some random water color paints I had brought with me. I started painting in the images, layering different colors together, mixing the mediums together to see what I liked best. In the end I went with the distressed oxides I just really felt the colours worked perfect for the images, so I painted a couple more images using the oxides. At this point I wasn’t sure where I was going so I decided to play around with the alcohol ink, which I was very limited (as I did not bring my stash with me) I just used Crimson red and rubbing alcohol and a straw to create this awesome background. It was simple yet packs a punch, even more so in person. Once the alcohol ink dried enough here was some areas where the ink pooled and was sticky so I pulled out some red foil from my Moms stash (Thanks mom for sharing your supplies with me) and added it to the alcohol ink, placing it over and gently rubbing it till the foil transferred. I kept the rest of the card fairly simple allowing the focus to be on the Laughing Animals. I stamped the sentiment directly on to the colored image. From there I die cut the main image using a retired My Favorite things die. I then trimmed down the alcohol ink background and layered it on top of some black cardstock to make it pop. I did this also for the main image. I layered everything on to a red card base I created. 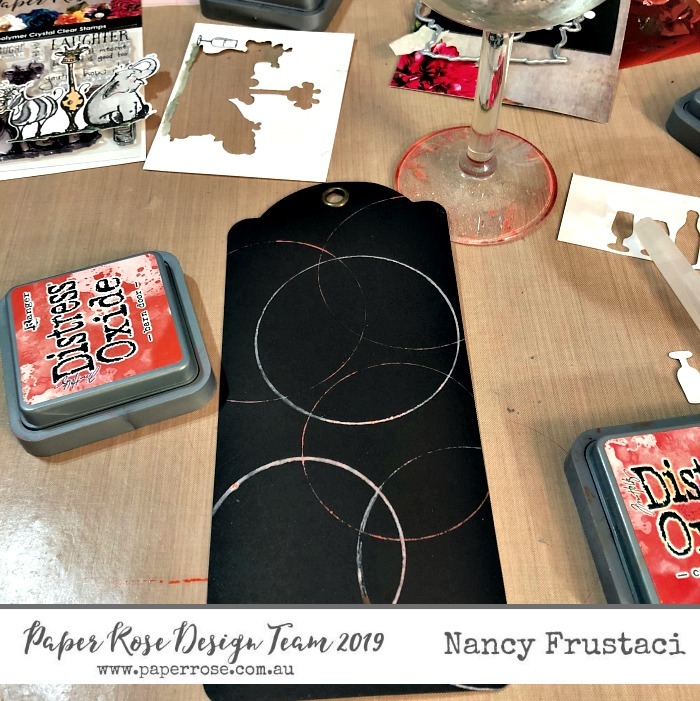 I only popped up the main image and the wine glasses and bottle which I die cut with the coordinating die, as I really wanted them to stand out. 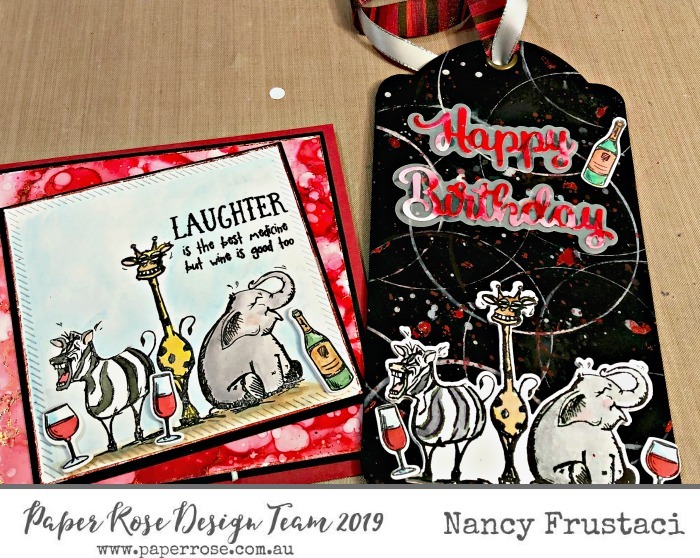 For a little extra I am sharing the tag I also created, using the same stamps set. It was so cute I couldn’t stop at one project. I had this idea to create a tag but wanted it to look like there were wine glass rings, no I didn’t have any stencils with me or patterned paper, so I decided to improvise. I took a wine glass and inked up the bottom using distress oxides, spritzed it with water and pressed it on to this Graphic 45 black tag. I repeated it with a few different colours (not that you can really tell as it oxidized a lot) but I still love the way it turned out. Before I added all the images and sentiment onto the tag, I flicked on layers of distress ink and some finetec shimmer paints. I also added some zig two-way glue in random places of the tag, allowed it to turn clear and then went in with the same red foil. Love how it tuned out. 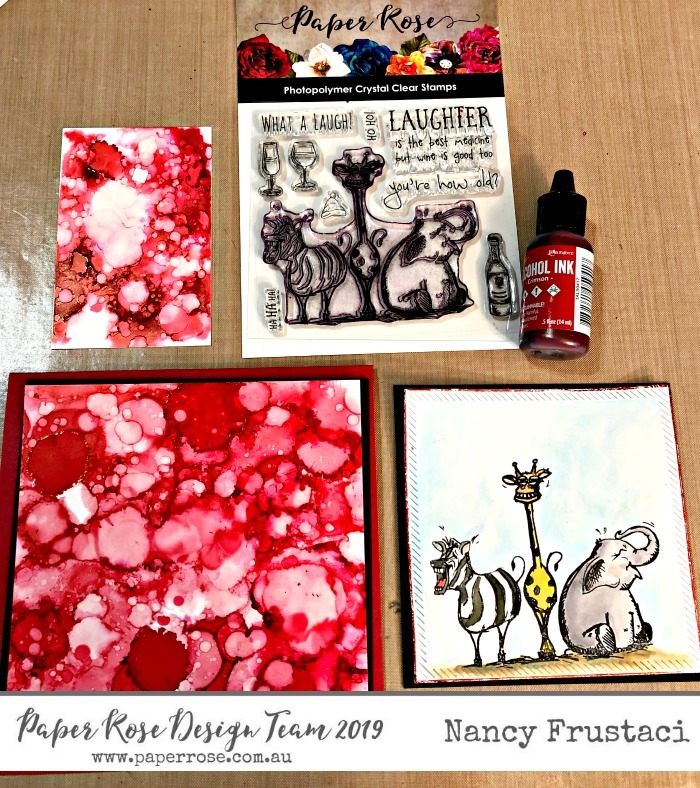 I set that aside and die cut out the images and sentiment using left over parts of the alcohol ink back ground and the Paper Rose Happy Birthday die, love this because it has the shadow for it. Thank You for viewing and I welcome your comments or feedback. Hope you have found some inspiration within. Have a Great Day!